Here comes the queen! 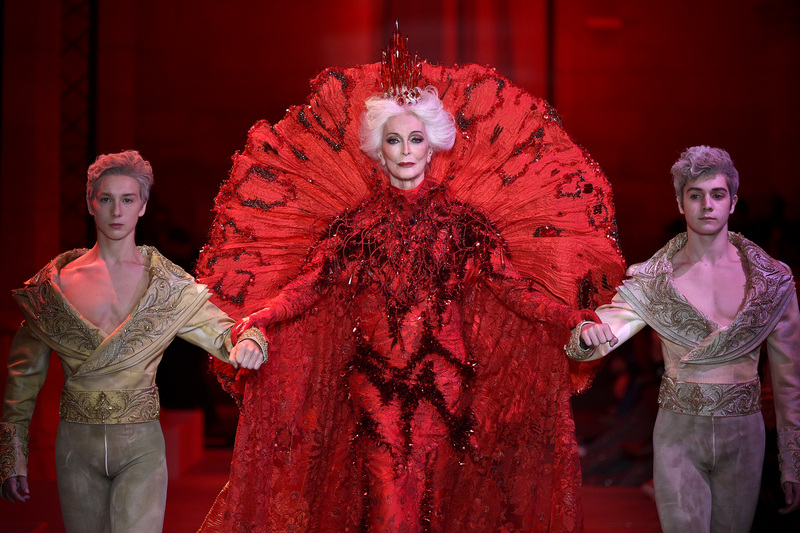 Octogenarian model Carmen Dell’Orefice closed couture in Paris with the finale look at Guo Pei. The regal 85-year-old beauty walked the runway escorted by two young men in tights. Dell’Orefice modeled an ornate beaded red gown with an elaborate cape with a stiff circular collar that fanned out behind her white locks, which were crowned with a beaded crystal tiara. Chinese designer Guo Pei is best known for outfitting another queen—Rihanna famously made an entrance to The Met Gala’s 2015 exhibition, China: Through the Looking Glass, in a canary-yellow fur-trimmed robe with an enormously long train by the designer. It has been very en vogue to feature icons in their golden years. Lauren Hutton, 73, walked Bottega Veneta’s runway for Spring/Summer 2017 and starred in the ad campaign. Joni Mitchell was the face of Saint Laurent in 2015 at the age of 71 and Joan Didion fronted the Céline campaign at age 80. Lee Radziwill trailblazed the trend by gracing the cover of T magazine in 2013 at age 79. Dell’Orefice is currently filming a documentary about her life with Victor Skrebneski, which we hear might be released this year. The documentary will feature cameos from Ralph Lauren, Cindy Crawford, and Hubert de Givenchy to Bergdorf’s Betty Halbreich and Thierry Despont, according to IMDB.